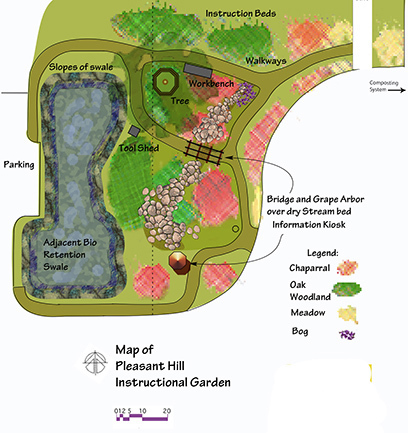 To educate students, staff, and community members in the need for water conservation with a demonstration garden using no pesticides, water recycling methods, drought tolerant and native plantings. Education Center on Santa Barbara Road. The official groundbreaking for the garden took place on Sept 15, 2007, Pleasant Hill's Community Service Day. The garden is located across from Pleasant Hill Middle School, behind the Pleasant Hill Library. It was used as a parking lot; it’s now a lovely demonstration garden and a learning opportunity using healthy garden practices including no pesticides, water conservation and recycling methods drought-tolerant and native plantings, and other sustainable practices. PHIG is an affiliate of California Garden Clubs, Inc. and is a certified Wildlife Habitat by the National Wildlife Federation.